From the top all the way down is your desktop dark but not the video player. 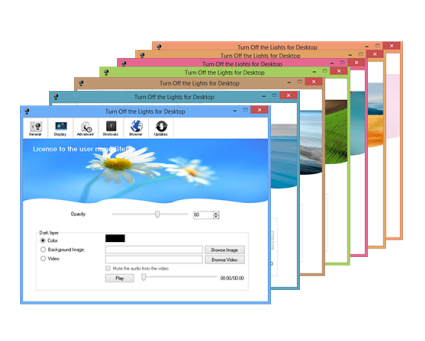 Turn Off the Lights work also great with your operating system. If you use a Windows computer or Surface Pro, with one click on the lamp button it dims your desktop. And highlight only the programs you want to see. What we learn from the Turn Off the Lights browser extension is now available for the desktop users. With the same technology and principle. Now it's time to do real stuff done at night, without seeing too much white light from your screen. 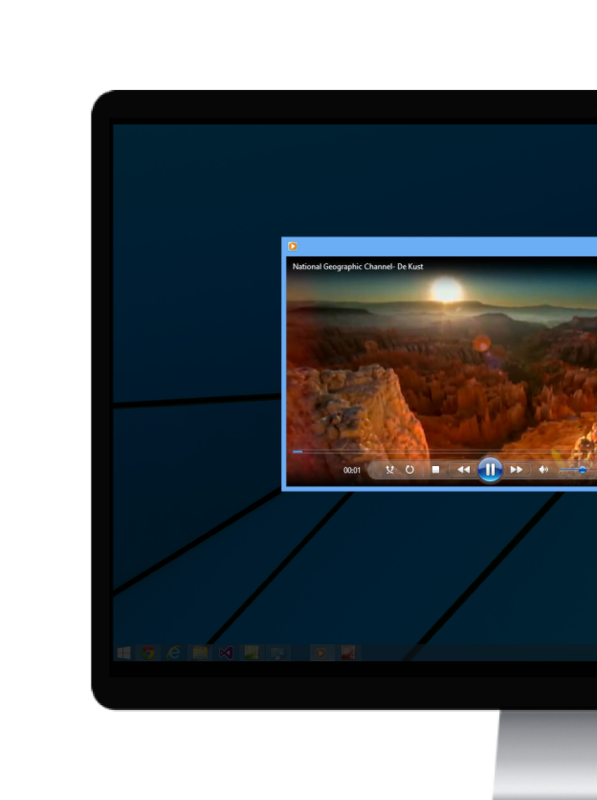 And yourself choose the application that must go not dark, example a media player or an Internet browser. The time has come that day will be night and night stay night. 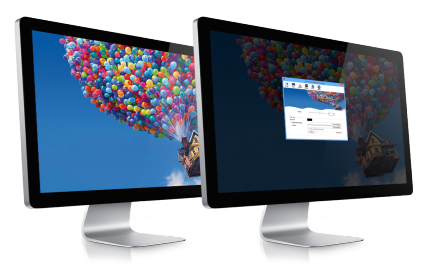 Do you want to dim your desktop? 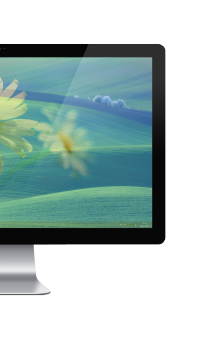 Then, with one click on the lamp button it dims the brightness level of desktop background. Click again, it returns back as normal. When you click right on the lamp button in your taskbar. You can open up the setting menu where you can change the color and opacity of the layer. By default, the dark layer is set to 60% opacity, but in the option window you can increase or decrease this value to your own comfortable view. Black is more energy-efficient and is the default color of this layer. But you can change to whatever color you want to see. You can choose between thousands of different colors in the color picker panel. It's also possible to use the movie layer to dim the background, when you click on the lamp button. If you turn the light back on, it pauses that video. When you dim the desktop it goes smoothly to the set opacity value. This effect can be disabled, if you want to get a direct response of the added layer. There are four custom shortcut keys in this application. One to close the application, do the lights off or on and the swap the background color between the ten colors. Every theme has been considered. This application is so designed that personality in each of all Turn Off the Lights users have an own look and feel for that personality. It changes to his wallpaper and theme color in Windows. Clean design and easy to control it. As a result, Turn Off the Lights is suited for all users. One of the most important features in this application. 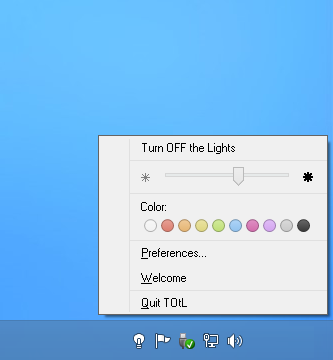 You can easily enable this option to automatically dim your personal desktop when it's night (example at 10.00pm). And when it's back day light (example at 7:00 am), it returns back to the normal light density. The technology that protects your eyes when it's night. When you are not here it will dim only your personal desktop when you are not working on the computer for a specific time. As an option, you can show a pin code form, to unlock the dark layer. You can unlock it with your own chosen 4 digit number. 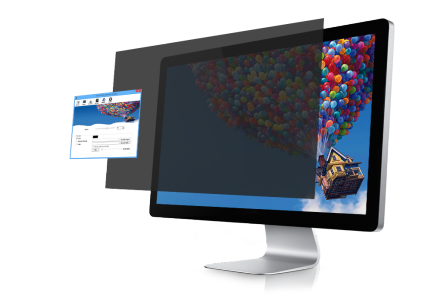 This advanced software is designed and developed for desktop computer, notebook, netbook, ultrabook and tablet. Turn Off the Lights with multi display support. One of the engineering design is that it works great with multi displays. Lights off on all contested screens. In the options page, you can choose the program to appear on top of the dark layer. For example, Windows Media Player™, Quicktime™, VLC Player™, etc. Also we have created a new media player. It is a player in a whole different dimension and outside the window. Aurora Player. Play and work on your desktop when it's night. It’s nearly impossible to watch a movie and write and text document or keynote. But this application you can easily watch a movie with example a 50% opacity and in the background you can write your text with a text editor. You always get the latest version of my application. If a newer version is available, the "Turn Off the Lights for Desktop" app automatically get update to the latest version, so you always get the latest great features. The update packages are small and is completely free. Just like the most popular browser extension works this with layers, and bring only the most important layer in front of your desktop. This will help you to be better concentrated when you are working.